Peat derives from the decomposition of vegetation in an acid environment lacking in oxygen. This process, which lasts several centuries, gives rise to a peat bog from which compact, fibrous peat can be extracted. It endows water with both a yellow amber color and acidity, which gives it slightly antiseptic properties. This means that some diseases are less common in acid water. The use of horticultural peat, which often has been enriched with various products, must be avoided in favor of the peat for aquarium use that is commercially available. Boil it for around 15 minutes before use. In the Amazon region of South America, the color of the water ranges from amber yellow to brown, due to the leaves and branches floating in it. In an aquarium, peat can be used in the filtering equipment to reproduce the characteristics of this type of water (low hardness, pH under 7, coloring). 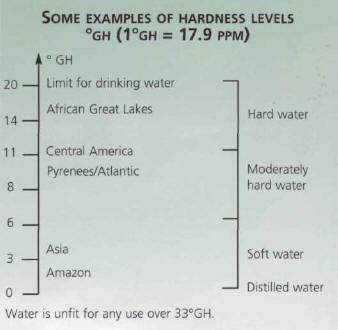 The hardness of water is expressed in German degrees (°GH or °DH), not to be confused with Celsius degrees (°C) for temperature: 1°GH is equivalent to 17.9 mg Ca/liter, or 17.9 parts per million (ppm). The term most often used to classify hardness is general hardness (GH), although total hardness (TH) can also be used. hard water, which is highly alkaline, at 12°GH or 200 ppm. 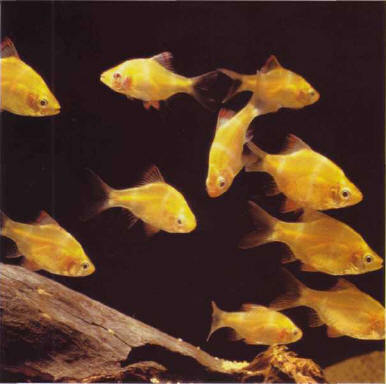 We will go on to discover that some fish families can adapt only to certain types of water. A colored indicator is used: the number of drops needed to obtain a change in color indicates the degree of hardness. How can the degree used by a manufacturer in a product be identified? 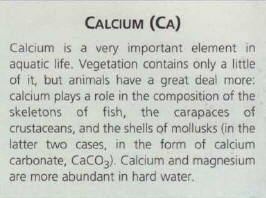 To confuse matters further, you may also come across °Clark in older books on fishkeeping. The old-fashioned Clark system for hardness was somewhat laborious, being based on measurement of the foam created by a soap solution, and has now become obsolete. If you have any doubts about the units used by the manufacturer of an analysis kit, just measure a GH you already know, such as that of bottled water. We have already seen that significant changes in the pH are prejudicial to aquaticlife, especially if they occur too abruptly. To compensate for this, nature has provided a screening device, the CH (carbonate hardness, i.e. the hardness due to calcium and magnesium carbonates and bicarbonates). The higher this is, the less the risk of any major variations in the pH. and vice versa. This phenomenon, known as buffering, can therefore only occur in acid fresh water. There is a relationship between the CH and the general hardness: the closer the CH value comes to the GH value, the more balanced the water. If the CH is less than 75% of the GH, you are likely to encounter a problem, and it is therefore not advisable to use water with these characteristics in an aquarium. 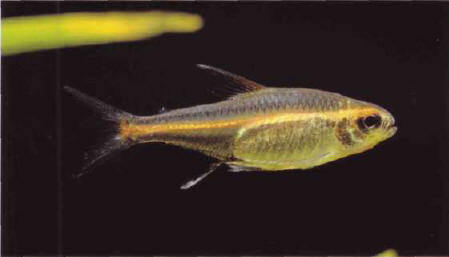 A Capeta tetrazona (here the golden variety) prefers soft to medium-hard water, especially for reproduction. 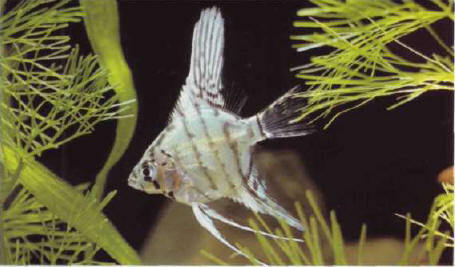 Sometimes the water available presents a hardness value inappropriate for its intended use in an aquarium. In most cases, the water will be a little too hard, and so the GH must be brought down for use in a mixed aquarium or a rearing tank. In other, less common cases, the water can be slightly too soft, and so the GH needs to be raised. The volume of water that can be obtained, and its price, obviously depend on which of these sources is used. Filling a tank with a capacity of several hundred liters with water of a precise hardness can sometimes be a laborious process. A final piece of advice: avoid using water from a domestic softener, as the calcium salts are replaced by other salts. Osmosed water (see page 17) is an attractive option, but the equipment represents a substantial investment. The water in question can be diluted with harder natural water, generally easier to find than soft water, or put some calcareous rocks in the aquarium, regularly monitoring the GH, or filter the water over oyster shells crushed into tiny pieces. Any modification in the hardness of water is matched by a modification in the pH: increasing the hardness of the water also increases its pH, and vice versa. target water, with a GH of 5°GH. GH water A - GH target water = 9 - 5 = 4. GH target water - GH water B = 5 - 3 = 2. The combination of 4 liters of water B and 2 liters of water A results in 6 liters at 5°GH. Filling a 180 liter tank will require 180 (6 x 30 times this mixture, i.e. 60 liters of water A and 120 liters of water B). Another example with the same water: filling the same tank with water at 7°GH will require 120 liters of water A and 60 liters of water B.
КУЗНЕЦОВ Николай Васильевич (р . 1939), российский математик, член-корреспондент РАН (1991; член-корреспондент АН СССР с 1987). Труды по математической физике, теории чисел.